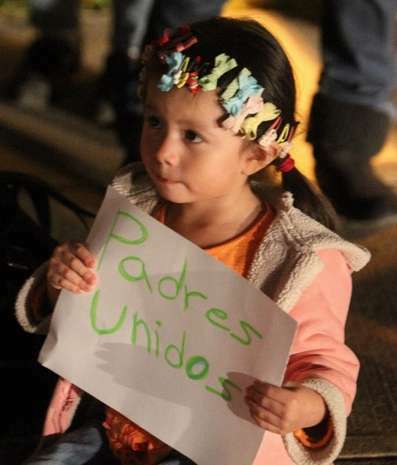 At the August 19 school board meeting, Dr. Klein proposed an “alternate transitional program” for Hispanic students. He made it clear that the students would not be registered in high school, but rather be provided with free food and English lessons. His comments were deeply offensive. This program would discriminate against students based on their ethnicity. We are calling on all parents, students, neighbors, and everyone who is shocked by this racist policy to come to the next school board meeting. New York State law says a person under twenty-one years of age is entitled to a public education. East Ramapo Superintendent of Schools, Dr. Joel Klein, who is responsible to deliver what the law requires, seems to feel that this law should apply to some people but not others. He wants to discriminate against: Hispanics, Teenage Parents, Immigrants, and Low-income people in general. Please do not fail to attend this important meeting for the future of our youth. When one group is targeted, we are all victims!!! These days one of the best ways to spread the word is by inviting Facebook friends to come to an event. Please join online and invite all your friends too! Thursday August 21 from 8:00 – 10:30 PM. 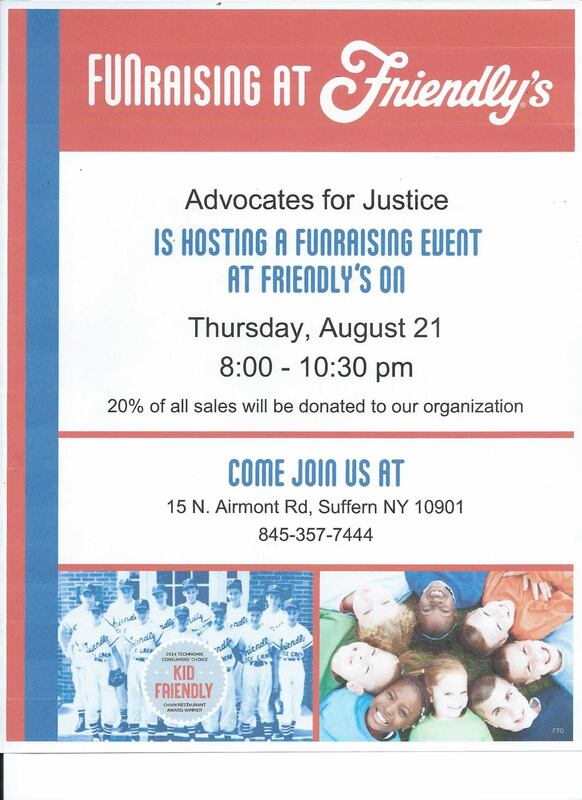 Come join us at Friendly’s Restaurant, 15 N. Airmont Rd, Suffern NY for food and fun! 20% of all sales will be donated to Advocates for Justice, the non-profit public interest law firm that is representing East Ramapo Parents in their class action civil rights lawsuit. Print this FUNraisingEventFlyer and bring it to the event. If you’re unable to attend but want to make a donation, go to www.poweroften.us and click on the Donate button. 2. School Board votes to sell Colton, Hillcrest AGAIN! Back in 2010, the school board voted to sell Hillcrest Elementary School. The sale was stopped by the Commissioner of Education and investigated by the NY State Attorney General. The appraiser was arrested last year and has now plead guilty and received his sentence in Clarkstown Justice Court. Back in 2009, the district claimed that decreasing enrollment was the reason they wanted to sell schools. Since then, enrollment is up, with more than 1000 more students than the district had projected! Given the high demand of the private school sector for new space, and the limited supply of real estate in overbuilt Rockland, real estate values would be expected to skyrocket. Why is the district selling off much needed classroom space at below market values? Trespassing wasn’t considered to be a big deal for the East Ramapo school board or Superintendent, even when dozens of strangers were on school grounds during recess. However, now that one intrepid activist has taken his camera to document failures to maintain and secure our schools, they have decided that, in this case, trespassing is a problem. Another fundraiser for Advocates for Justice has been organized by a Power of Ten Reader! This one will be at Friendly’s Restaurant in Suffern, on Thursday August 21 from 8:00 – 10:30 PM. Come join us at 15 N. Airmont Rd, Suffern NY for food and fun! 20% of all sales will be donated to A4J!!! Maybe you have a fundraising idea too? Contact A4J Executive Director Liz Turner at lturner@advocatesny.com; (212) 285-1400, Ext. 703) to share your idea! In the 54 days since Governor Cuomo announced the appointment of a fiscal monitor for East Ramapo, the district has taken decisive action to complete the sale of two schools. By now, the monitor must know that: the Attorney General is continuing his investigation into previous attempts to sell school property; an appraiser hired by the district has plead guilty to filing false documents; and the Commissioner of Education previously found that “the board abused its discretion by hastily approving the sale of Hillcrest”. Now that Governor Cuomo has personally involved himself in the plight of East Ramapo, the course of events in the district is under his responsibility and on his watch. Just as we have thanked him for it promising action, we must hold him accountable for results. Education is a right guaranteed by the NY State Constitution, and the East Ramapo school board derives its power 100% from NY State. The school board has flouted the authority of the State Education Department; is evading oversight and undermining the authority of the fiscal monitor and the governor by pushing through real estate transactions before the monitor had even one month on the job. The Governor can stop this; if not now, when?